Workspace software provider NFS has been chosen to be included among Crestron’s latest Room Scheduling Partners. 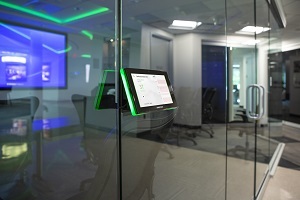 NFS’ Rendezvous Workspace meeting room scheduling technology will integrate with pioneering new room scheduling-specific touch screens developed by global automation and control solutions leader Crestron. These two companies will be showcasing their latest integration at ISE 2019 in Amsterdam, the world’s largest audiovisual and system integration show, on 5th- 8th February. NFS has partnered closely with Crestron since 2016. NFS Chief Executive Luis De Souza says the new TSS touch screens will allow workplace managers to take their use of meeting spaces to new levels of efficiency. It improves workplace collaboration, uptake of video conferencing - and reduces no-shows at meetings dramatically. "NFS and Crestron have been engaged for several years with strong API based integrations between our Rendezvous meeting room and desk booking solution and the Crestron Fusion platform,” he said. “This integration provides enterprise clients with a powerful resource scheduling solution (Rendezvous), seamlessly integrated with a great AV signage and in room control and management solution (Crestron). “NFS worked with Crestron to develop a version of our widely received application to run natively on Crestron’s TSS-series Scheduling Panels, supporting importing functionality including availability display, smart booking, check in/out and no-show tracking. “The new Crestron TSS-7” and 10” panels offer an affordable solution for companies seeking better display technology without any compromise in functionality or security - and of course, Crestron reliability is a given. The Crestron TSS screens are exceptionally easy to deploy and configure, thanks to Crestron’s latest XiO Cloud Remote Deployment and Management infrastructure . ”When NFS Technology Group expressed interest in being included among our line-up of Room Scheduling Partners, the choice was easy”, says Bob Bavolacco, Sr. Manager of Partnerships for Crestron. Crestron’s automation and control solutions for homes and buildings let people control entire environments with the push of a button, integrating systems such as AV, lighting, shading, security, BMS and HVAC to provide greater comfort, convenience and security. NFS and Creston will be exhibiting at ISE 2019 in Hall 2, Booth C20.